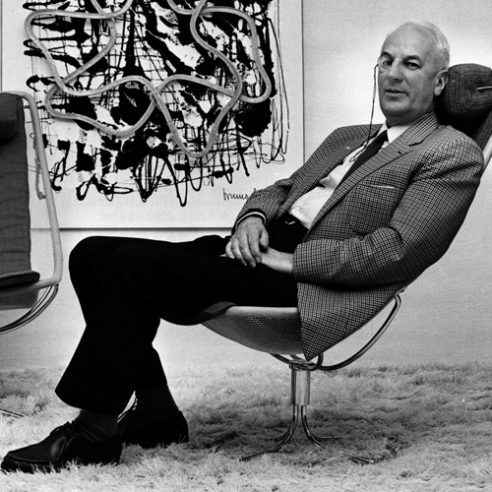 Bruno Mathsson continued his experiments with tubular steel following the introduction of the Jetson 66 chair in 1966. In 1986 a year before his death Mathsson completed his final experiments designing the Minister Chair and the Column Based Table. chairs including the commercially successful Mia series and the Milton and Mirja chairs designed specifically for conference use. The names (all beginning with the letter “M” a trait Mathsson gave to all his chairs designed for Brun0 Mathsson International) simply defined the type of base fitted to the same button stitched upholstery. In the early 1980’s a new series of height adjustable chairs, were added to the range and the Column Based Table and Minister chair were the final conclusion to Mathsson’s experiments with tubular steel.